While President Trump appeared to relish the idea of leading the federal response to Harvey and Irma, after Hurricane Maria devastated Puerto Rico last month he seemed largely focused on the U.S. territory’s massive preexisting debt. 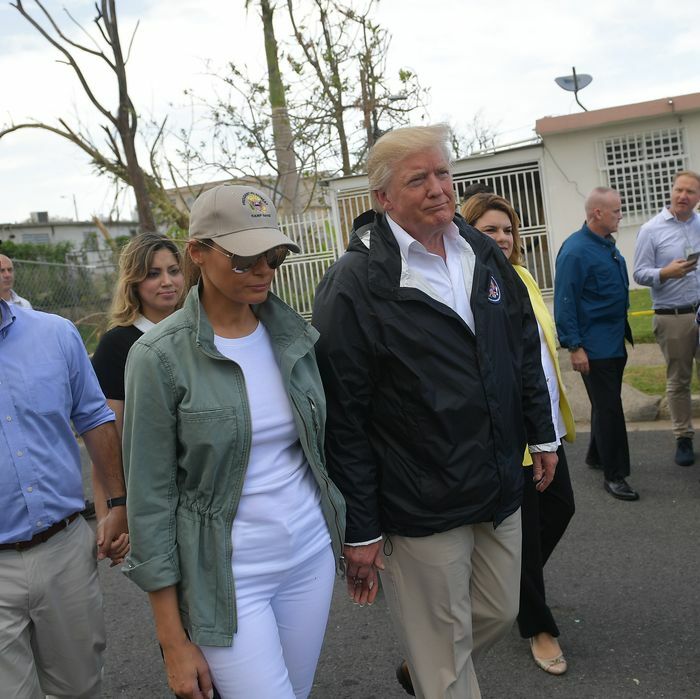 Trump’s visit only exacerbated calls for him to stop emphasizing that Puerto Rico is to blame for its problems, and do more to stop the growing humanitarian crisis. But there was one more strange moment from the trip that wasn’t revealed until Tuesday night. In an interview with Geraldo Rivera that aired on Hannity, Trump declared that Puerto Rico’s debt should be wiped out. Trump said Puerto Rico's debt will have to be wiped out. Thanks to a long recession, local mismanagement, and decades of shifts in U.S. law, Puerto Rico was indeed in dire financial straights even before Maria hit. The territory has roughly $70 billion in debt, high unemployment, a 45 percent poverty rate, and insolvent pension systems. In the summer of 2016, Congress passed a bill, which President Obama signed into law, which allowed Puerto Rico to restructure its debt, and created a federally appointed fiscal oversight board. In May, Puerto Rico filed for the biggest municipal bankruptcy in U.S. history. The problem, as is often the case, is that no one knows what Trump was talking about. On the campaign trail, Trump stressed that the U.S. shouldn’t “bail out” Puerto Rico — though Governor Alejandro Garcia Padilla said they were merely seeking the legal ability to restructure their debt, as Trump has done many times. Then, as president, he accused Democrats of trying to force a government shutdown to “bail out” Puerto Rico, when they were actually pursuing funding to keep qualified U.S. taxpayers from being kicked off Medicaid. … To “wipe out” $74 billion in municipal debt, billions of which are guaranteed by the island’s constitution, would shake investor faith in a market long considered one of the safest of havens. Lower rated municipal borrowers would almost certainly see their borrowing costs rise to account for the added risk. Some of the island’s bondholders have been lobbying Congress and the White House to replace the members of the oversight board, but legal changes would be tricky as well. A Trump-appointed board couldn’t change Puerto Rico’s debt repayment plan without approval by a federal judge in New York. So Trump’s remarks might mean that after witnessing the devastation in Puerto Rico, he’s dedicated to figuring out a solution to its debt problem that doesn’t cause more suffering for the island’s inhabitants. Or it’s possible that he thought it might be good to shift some blame to Wall Street after lashing out at Puerto Rico for the past few days. Either way, it’s a more positive development than the president throwing paper towel rolls into a crowd of hurricane victims.